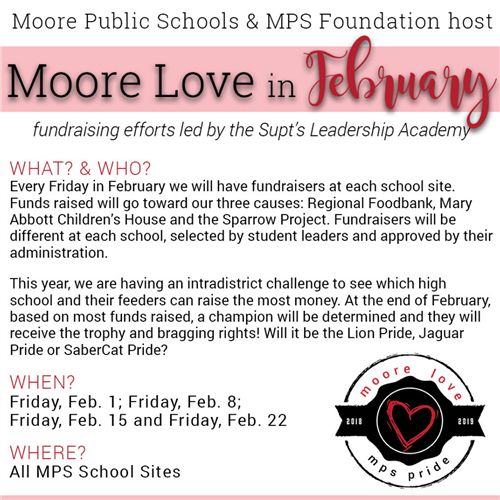 We are excited to share that Moore Public Schools and the MPS Foundation annual philanthropic initiative, “Moore Love,” will be throughout the entire month of February and that this year we will raise funds for three very important causes. Our plan is to have a friendly, intra-district challenge. Our three high school leadership students will work directly with their feeder junior high and elementary schools’ leadership students. At the end of February, based on most funds raised, a champion will be determined and they will receive the trophy and bragging rights! Will it be the Lion Pride, Jaguar Pride or SaberCat Pride? The fundraisers will be at every school site on Fridays during February – 1st, 8th, 15th and 22nd. All of the money raised will go toward the three causes. Entire month of February with main events held on each Friday in February.